Located in the northern Misiones province of Argentina, Iguazú Falls is one of UNESCO’s Seven Natural Wonders of the World, surrounded by 67,000 hectares of protected national park. This entire area encompasses the remaining portion of the Atlantic Forest, which is home to several types of eco-regions and a vast, biodiverse community of plants and animals that cannot be found anywhere else in the world. 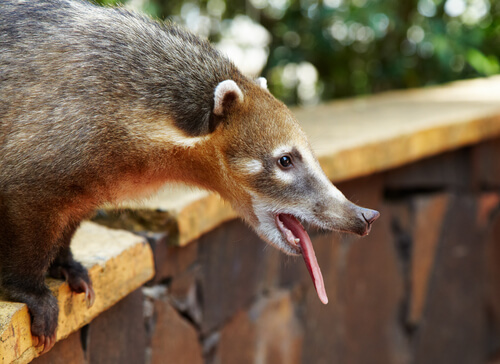 Park residents include jaguar, coatí, caimans, ocelots, opossums, anteaters, jaguarundi, tapirs, and countless species of birds, butterflies, and other insects. The Iguazú falls system is made up of 275 individual waterfalls, with the biggest and most famous being the Garganta del Diablo, or Devil’s Throat waterfall. 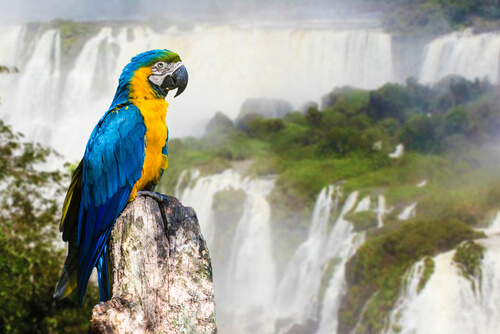 Both Argentina and Brazil play an important role in managing the conservation of the area, which includes research efforts on the subtropical rainforest and its enormous range of unique plants and animals. 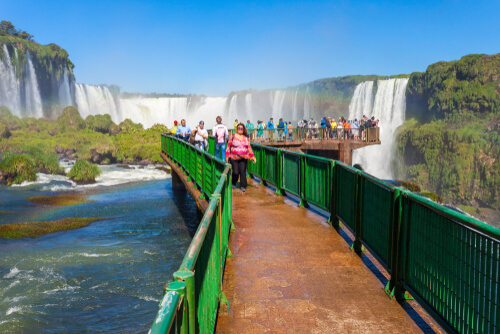 Most of the falls lie on the Argentinian side of the border, where a well-maintained system of catwalks – engineered to have minimal impact on the landscape and the environment – allows visitors to get as close as possible to the water. According to local Guarani legends, Iguazú Falls was created when the Serpent God, M’Boi, jealously cursed a pair of lovers, Naipi and Taruba, to be separated by a huge waterfall. The Serpent God was so furious that he couldn’t have the beautiful Naipi that his rage created a huge chasm in the earth, which formed a mighty river. Naipi and Taruba were turned into a rock and a palm tree. Legends say that the lovers are responsible for creating the frequent rainbows over Iguazú Falls, despite M’Boi’s best efforts to keep them apart. The town of Puerto Iguazú serves the steady stream of visitors who come to see the falls, and boasts a range of fine restaurants, charming hotels, and indigenous community projects to highlight conservation efforts in the area. 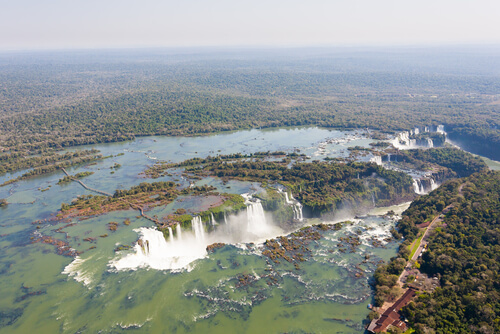 There’s a point at the western end of Puerto Iguazú, Las Tres Fonteras – the Three Frontiers Landmark – where you can see Argentina, Brazil, and Paraguay at the same time. In the evenings, the landmark lights up with a rather vibrant audiovisual laser show that takes advantage of the evening mist. During your free afternoon, pop by the tiny Jardin de los Picaflores, or Garden of the Hummingbirds, which is an amazing, intimate spot for nature photographers and birdwatchers. 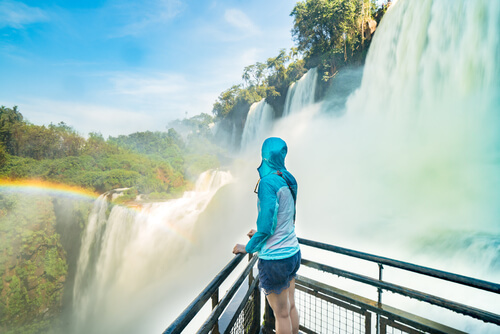 On the Argentine side of the falls is the Parque Nacional Iguazú, which has maps of the park, walking trail guides, souvenirs, and historical information about the area. The park features a Jungle Ecological Train to minimize the human impact of tourism, which takes you from the Visitors’ Center to the Falls Station, where the Upper and Lower walking trails begin. There’s also a train to the Devil’s Throat, which is otherwise about a 1.2km walk. There also a few basic convenience stores located by the train stations to grab water and snacks. When preparing to visit, check out the official park site for more information on food, rental lockers, and accessibility.